Friends and regular readers of my writing here and at Lipsticking know that I’m going through some major adjustments with my mother. Fiercely independent. Unwilling to ask for help. Unwilling to accept help. Well, that explains me…but it also explains why my mom ended up where she is…in an assisted living home here in Albuquerque, with multiple major ailments. So, where AM I going with all of this? Well, Mom and me talk every day. Some days it goes well. Some days not so well. However, on Saturday, as I was taking her back to her new house (from her first venture to my dearly loved casa for dinner), she asked, “Do you really feel at home here?” Hey! Glimmer of hope! My answer was, “Yes, I love it here, wouldn’t live anywhere else.” …as I silently wished/hoped/prayed that happiness and that deep, heart-felt sense of home will be catching. So, here’s hoping I can help my mom be happy, by my being happy. Hey, if I so love it here, there must be SOMETHING to it, right? My ephipany (after more than one martini and more than a few tears) is that I CANNOT make anyone else happy. Well, duh! I know that, but believing it is another thing entirely, isn’t it? And, how many millions of other women (and women are the overwhelming majority of elderly caregivers) are facing the guilt-ridden, heart-hurtin’ issue? We wanta make it perfect. We NEED to make the parents smile. Well, we can only do so much. Something for all us to remember – both for our parents and for our “old old” age.” Happiness is always a choice. P.S. 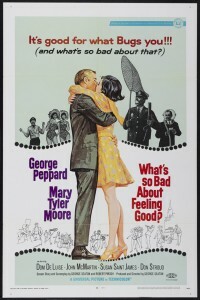 The above image is from a 1968 movie, What’s So Bad About Feeling Good? In which happiness really IS contagious. A virus is started by a toucan (that’s a bird). George Peppard in all his young blond glory. Mary Tyler Moore. Giddy. Stupid. Fun. Happy Ending. HIGHLY recommended for a Friday night movie fest with pizza and – ahem – adult beverages.